Selborne's Oates Memorial Museum at "The Wakes". Episode: 17. Site Number: 009. Date Posted: 3 August 1996. Update 11 March 2000. Location: Selborne nr. Alton, Hampshire GU34 3JH, England. Type: Museum. In sacrificing himself on the return from the Pole so as not to slow down his companions, L. E. G. "Titus" Oates earned his place, along with Scott and Wilson, in the pantheon of heroes of British polar exploration. He is suitably memorialized at the Oates Memorial Museum, housed in "The Wakes," Gilbert White's parsonage in the delightful Hampshire village of Selborne. (White was the father of natural history literature; his book, The Natural History & Antiquities of Selborne (1789), is said to be the fourth most published book in the English language!) Although most of the attention at "The Wakes" is devoted to White, there is a good deal pertaining to the Oates family, Oates himself and his uncle, Frank Oates, a naturalist and African explorer. 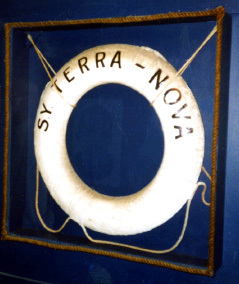 The Museum features many artifacts and items associated with L. E. G. Oates and Scott's Last Expedition: A life preserver ring from the Terra Nova, its Royal Yacht Squadron pennant and a model of the ship; a stained glass window with snow cairn and cross depiction of the final camp and the inscription at the base: "I'm just going outside and may be some time;" a reduced scale "mockup" of the "Tenements" at Cape Evans; an oil portrait of Oates in uniform; Oates' dress uniform & sword [since removed]; what appears to be a model of the Observation Hill memorial cross and a variety of polar equipment including a snowshoe, primus stove, crampon, sledge and meter wheel, ski pole and a tin of Horlicks malted milk brought back by the official search party. When you visit Selborne be sure to climb to the top of The Hanger via the Zig Zag Path, laid out by White and his brother.